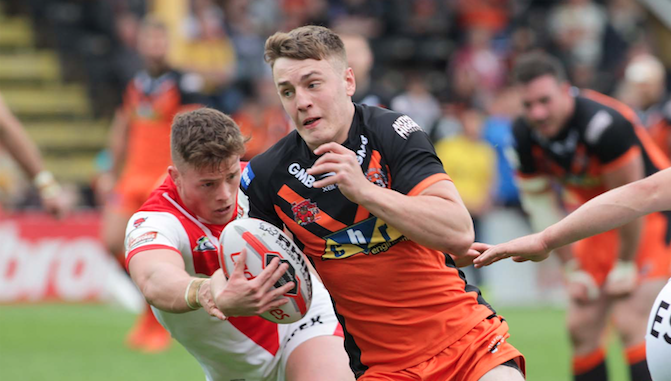 Castleford ace Jake Trueman has admitted there’s pressure on him to deliver in the absence of Luke Gale and after taking the number six shirt at the Tigers. The 19-year-old half-back enjoyed a tremendous 2018 season as he was named Super League’s Young Player of the Year and was duly rewarded with a four-year deal at the Tigers in November. Trueman was recently handed the number six jersey, having worn 21 last season, and he concedes that the heat is on for him to perform as a more recognised member of the squad with the new campaign just weeks. “Personally, I don’t want my levels to drop from last year,” Trueman told loverugbyleague.com. “I want to have another good season with the club, although I know that it’s going to be more difficult. There’s more pressure on myself as people know who I am this year. I’ve just got to try and take my game to the next level this season. “It’s nice to get the number six shirt and it’s a good achievement for myself but it’s certainly not a guaranteed starting spot. Castleford have been hit by the news that former Man of Steel Luke Gale is almost certain to miss the entire 2019 campaign due to a ruptured Achilles tendon. Trueman stated that he and the squad’s other half-backs must step up in Gale’s absence. “Like everyone at the club, I’m gutted for Luke,” he continued. “Luke missed a lot of last year with injuries and I would have liked to have played alongside him this year to learn from him. “Leadership is something that I’m looking to work on this season and I’ve spoken to Daryl [Powell] a lot about it during the off-season. “As a half-back, you’ve got to be a leader and someone that can organise and dominate the match – that’s one of Luke’s strengths, so without him the other two halves are going to have to step up in that department. After defeats in the 2017 Grand Final and the 2018 semi-final, Castleford have been labelled by many as unable to perform at the business end of the season. It’s a tag Trueman is eager to dismiss. “The main thing for ourselves in 2019 has to be our performances in the big matches,” the former Bradford Bulls junior insisted. “We’ve had two massive matches over the past two seasons, with the Grand Final (2017) and the semi-final (2018), and we’ve turned up and not put in a good performance. Our main aim is to perform when we do get to those big matches. Obviously, we’ll learn how to cope with those situations through our past experiences, but it is something that you can learn in training as well. “If we can put each other under pressure every week during training then we’ll be used to those sorts of scenarios when the big matches come around.